A dialyzer is a medical device that replaces the function of kidney by removing excess water and metabolic waste products from the blood using an artificial membrane, often known as hollow fiber. Dialyzers are primarily used by the medical professionals while performing hemodialysis. Hemodialysis is a medical procedure used to remove waste from the blood of the patients with chronic or acute kidney failure. Waste removal helps to maintain electrolyte balance in the patient’s body. It also prevents accumulation of salts and wastes in blood, which is expected to lead to poisoning. The significant increase in geriatric population and rise in incidence of renal diseases, especially end stage renal disease (ESRD) are the major factors that drive the growth of the global dialyzer market. In addition, increase in funding for improved dialysis products and services, rise in incidence of diabetes and hypertension, and shortage of kidneys for transplantation are expected to further propel the market growth. Although the dialyzer market trends continue to grow, certain factors hamper the growth of this market. The complications and risks associated with the procedure of hemodialysis, such as severe anemia and fluid overload, hamper the market growth. 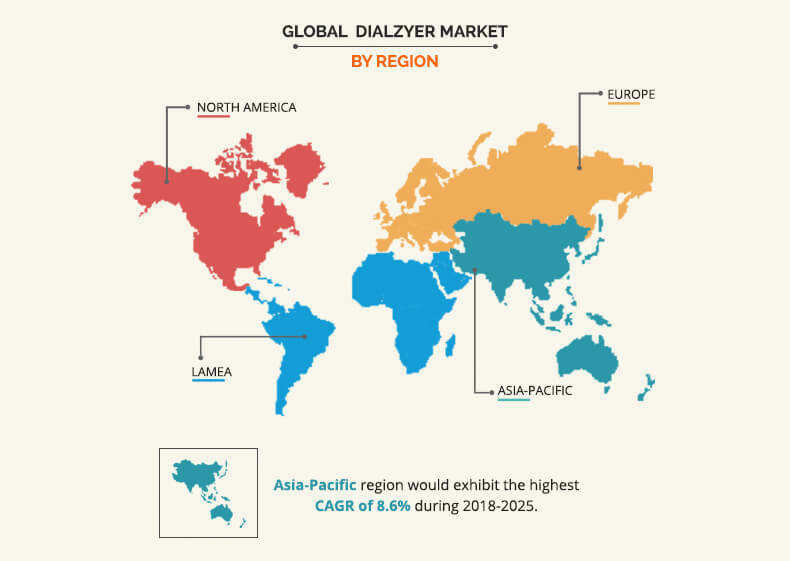 Conversely, technological advancements leading to better adoption and opportunities in emerging economies are anticipated to offer growth opportunities for the global dialyzer market. Based on dialyzer market analysis by type, the market is categorized into high-flux dialyzer and low-flux dialyzer. The high-flux dialyzer segment was the highest contributor to the market in 2017 and is anticipated to grow at the fastest rate during the forecast period as more efficient in the removal of larger molecules while performing dialysis as compared to the low-flux dialyzer. In addition, its use is eventually based on the need to reduce the high morbidity and mortality of endstage renal disease (ESRD) patients maintained on conventional dialysis by offering better biocompatibility and enhanced removal of uremic toxins. Based on end user, the dialyzer market is bifurcated into in-center dialysis and home dialysis. The in-center dialysis segment accounted for the highest dialyzer market share in 2017 and is projected to continue the same during the forecast period. This is attributed to the availability of trained medical staff in dialysis centers that helps to provide better services to the patient and contributes toward market growth of in-center dialysis. Furthermore, high quality care and management provided to the patient and use of high-grade equipment helps increase the revenue generated by this segment. However, the dialyzers used for home dialysis are anticipated to grow at the fastest CAGR during the forecast period, the emergence of advanced dialysis products with improved efficiency enables patients to opt for home dialysis thereby boosting the market growth. Moreover, new and easy-to-use machines are being developed for home hemodialysis by the leading manufacturers such as Fresenius Medical Care. Based on region, the global dialyzer market is analyzed across North America, Europe, Asia-Pacific, and LAMEA. North America dominated the market in 2017, accounting for the highest market share, and is anticipated to maintain this trend throughout the forecast period. This is attributed to the significant rise in prevalence of end-stage renal disease (ESRD), diabetes, hypertension, and others in this region. However, as per dialyzer market forecast, Asia-Pacific is projected to register the highest growth rate from 2018 to 2025, owing to the increase in healthcare expenditure, improvements in healthcare infrastructure, and rise in medical tourism. The report provides a comprehensive analysis of the leading companies operating in the global market such as Asahi Kasei Corporation, B. Braun Melsungen AG, Baxter International Inc., Browndove Healthcare (P) Ltd, Bain Medical Equipment, Fresenius Medical Care AG & Co. KGaA, Kawasumi Laboratories Inc., NIKKISO CO., LTD., Medtronic Plc. (Bellco), Jihua Medical Apparatus & Instruments Co., Ltd, Allmed Medical Care Holdings Limited, Weigao group, Farmasol, China Chengdu Wesley Biotech Co., Ltd, Toray Industries, Inc., Medica Group, JMS Co. Ltd, Jiangsu Lengthen Life Science and Technology Co., Ltd, Medivators, Inc. and Dialifegroup. 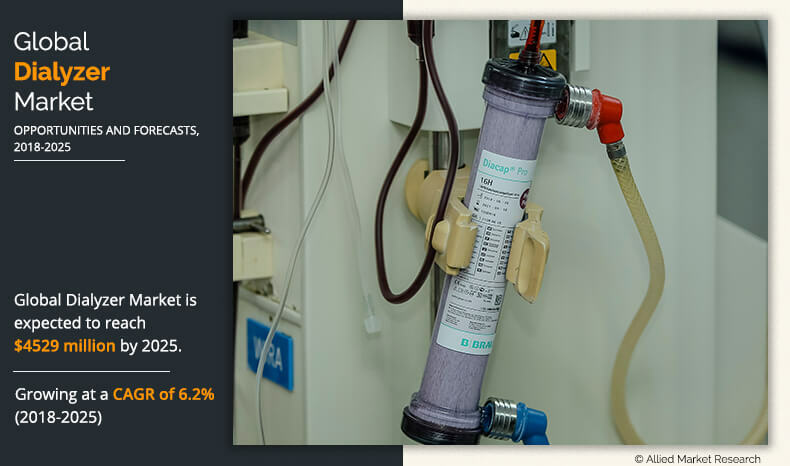 The study provides an in-depth analysis dialyzer market share with the current trends and future estimations to elucidate the imminent investment pockets. A comprehensive analysis of the factors that drive and restrict the dialyzer market growth is provided. An extensive analysis of the key segments of the industry helps understand the market trends. 7.4. BROWNDOVE HEALTHCARE (P) LTD.
Dialyzer also termed as artificial kidney is a device that is used by the medical professionals while performing hemodialysis. Hemodialysis is the most popular and preferred form of treatment for chronic renal diseases and kidney failures. Hemodialysis can be performed in hospitals or in dialysis centers and even at home. Rise in the incidence of kidney failures, surge in ESRD patients across the globe, increased occurrence of diabetes, surge in funding for the development of new products with advanced technology, and lack of matching donors for kidney transplantation are expected to propel the growth of the dialyzer market in the near future. However, lack of awareness about kidney diseases, product recall, and risks associated with the reuse of dialyzer are expected to hamper the market growth. The adoption of hemodialysis is highest in North America owing to an increase in the adoption of dialyzers, high prevalence rate of renal disorders, and growth in disposable income among customers. The adoption rate in Asia-Pacific and LAMEA is expected to increase due to rise in disposable income, surge in the incidence rate of kidney failure, and growth of the geriatric population.